Emutel Duo is a convenient and flexbile basic rate and primary rate ISDN network simulator. With 3 software selectable S/U interfaces and optional 2 E1/T1 interfaces you can test and develop a full range of ISDN equipment. Emutel Duo comes with a comprehensive protocol analyser that allows you to decode and analyse layers 1, 2 and 3 of the D channel to varying levels of detail. Develop for other countries’ networks using the range of support cards. One card is included in the package - choose from either Euro-ISDN, North American, NTT, VN3, 1TR6 or BTNR191. 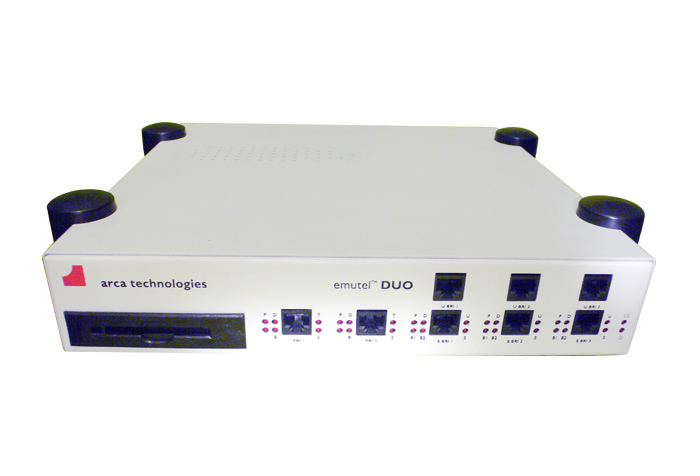 Emutel Duo is managed/configured remotely using the optional internal modem for dial up management. Attach to the unit from any PC via the LAN or through the terminal connection locally to configure and monitor the system. Almost every feature of Emutel Duo can be customised, for example, port telephone numbers can be changed, special numbers to activate specific network conditions such as User Busy or Call Rejected can also be set and the line power can be switched on or off. Emutel Duo is supplied with protocol analysis and 1 network personality card as standard. 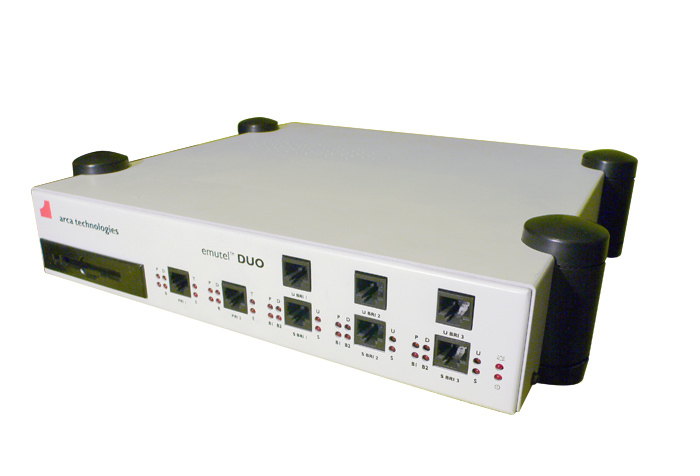 Emutel Duo can be managed/configured locally or remotely with an option of an internal modem for dial up management. Emutel Duo can be attached to the LAN and configuration and analysis can be done from a remote PC in the network. This allows you to operate Emutel Duo in another building but configure and monitor the unit from another location. Emutel Duo is also extremely easy to use with indicator LEDs showing at a glance what each terminal is doing and a windows application program displaying Protocol Analyser information and allowing extensive device configuration. At just 2.5 Kg Emutel Duo is easily portable and, since terminals can be powered directly from the interfaces, it really is the ideal system for use at demonstrations, presentations and exhibitions. In addition, Emutel Duo’s universal power supply, which automatically switches between 240V and 110V, ensures that the system is transferable between the US and Europe without any adaptations. Price and availability of Emutel Duo can be requested by contacting the arcatech. Basic System (3xBRI S/U software selectable) Includes protocol analyser, ITU and one additional support card of your choice. emutel Duo - 2 ports BRI-S and BRI-U Simulator Presentation.